KNOW YOUR WATER. CATCH MORE FISH. Understanding water levels helps fishermen to determine where and when too fish. High water levels may mean unfishable conditions. Low water levels may require you to go to deeper areas. Until you start capturing this information when you fish, you will never know. Water discharge or "streamflow" is an excellent measurement for fishermen to gauge the velocity of water moving in a reservoir, river or stream. Fly fishermen and steelheaders fishing rivers and streams, and bass fanatics fishing reservoirs have learned that changes in flow directly influence where fish hold and feed. Pay attention, capture data and hone in on places matching current conditions. Water clarity is an important factor when fishing. Most freshwater fish are visual feeders and require clear water to identify and select their bait. Fishing clear water requires a completely different setup and color selection compared to fishing murky waters that require noisy, scented baits. 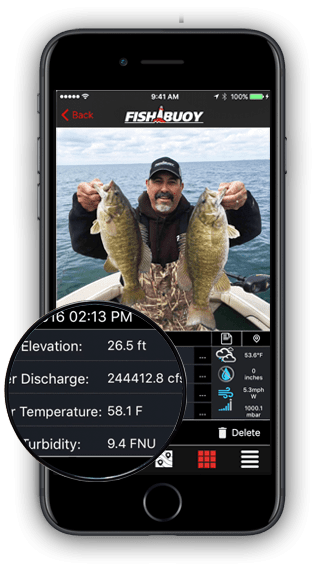 FISHBUOY Mobile helps you determine a historical pattern related to water turbidity, location and bait color selection.